Welcome to DoubleTree Suites by Hilton Hotel Tucson Airport. Step into and relax in the 25-ft. ceiling lobby complete with a signature fireplace centerpiece. The hotel is set near the Tucson International Airport (TUS) and just a short ride away from downtown Tucson and the University of Arizona. Indulge in some retail therapy at the Tucson Spectrum Shopping Mall. Enjoy a freshly baked DoubleTree cookie and let our staff show you to your guest suite. Our standard two-room suites all feature contemporary furnishings and décor, with modern amenities to make your stay more comfortable. Swim laps in the hotel's outdoor pool and relax in the whirlpool spa, or unwind in our outdoor patio areas with beautiful water fountains. Stay fit in the hotel's fitness center with cardio machines and weights. Stay on top of work in the business center, fully equipped with top business amenities to make your stay successful. Host meetings in our 12,000 sq. ft. of flexible meeting space, and wind down after a long day in the hotel's signature restaurant, Finnegan's Restaurant and Bar, which offers bistro-style cuisine in a bright, modern setting.Please note that we provide in-house catering for all events. For a Future Site Tour please call me direct to set up an appointment, I look forward to hearing from you. Cancellation Policy: If cancellation of the booking becomes necessary to avoid forfeiture of any deposits paid or payment of penalties, the hotel must have written notification no later than 30 days prior to arrival. 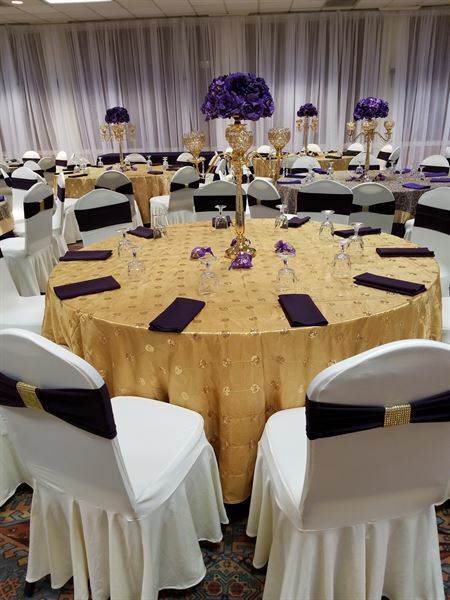 Host your wedding and reception at our DoubleTree Suites by Hilton Hotel Tucson Airport and you can have the wedding of your dreams. Located a mile from Tucson International Airport, our indoor and outdoor event spaces have room for up to 350 guests. The Solarium Ballroom holds up to 120 guests and features an ambient fireplace and French doors and windows. For larger receptions, The Agave Ballroom holds up to 250 guests in style. With onsite catering, A/V equipment rental and other amenities, we'll help create a ceremony and reception that fit your needs. Relax and enjoy your special day knowing our experienced staff will take care of everything. Food is comfort! We make it easy for you to enjoy a delicious meal without even leaving the hotel. Whether you are into healthy foods, snacks, or hearty meals, we’ve got something wonderful for your palate. Dine in a casual setting, watch the latest sports events, dine under the Arizona skies outdoors or unwind with after-dinner drinks at the bar. You can also choose to stay in your room and use our in-room dining service. We make it easy! Finnegan's Restaurant & Pub offers bistro-style cuisine in a bright, modern setting. Enjoy a variety of fresh and delicious menu items in a casual, friendly atmosphere. Dine indoors or on the patio. Keep up with the latest news or watch a variety of sports on the big screen televisions while having lunch or dinner. We want to offer you the best atmosphere for your particular rental needs at The Sea of Glass, and we've designed our venue acoustically and aesthetically to provide the greatest range of options, whether a concert, a party, a wedding, a dance, a yoga workshop, a training session, or a simple meeting. Our unique establishment offers a variety of venues: The main Event Hall, a more intimate room called The CosmoArt Studio, a beautiful outdoor courtyard and upper patio with water feature and beautiful views, as well as a Lunge and bar area. The Event Hall is equipped with state of the art audio and lighting, as well as a projector and full-size, retractable movie screen. Say hello to the only Tucson hotel with a streetcar stop. We are located in the heart of downtown, and close to the UA, Tucson Convention Center and shops, restaurants and nightlife in downtown area, main gate square, and Mercado Entertainment districts featuring with 132 deluxe sleeping rooms with a complimentary hot breakfast included and meeting space to accommodate from 5-250+ with both catered and flexible catering options available. Here at Celebrations Party Spot you can rent the basic hall and bring in your own food and drink, have it catered or let us take care of it for you. Celebrations Party Spot was established in 2007 and has been responsible for providing a beautiful and affordable venue along with decorations, cakes, flowers and event planning. Our specialty is in the area of customer service and satisfaction. Our regular customers particularly value the personal attention, clean environment and tasteful decor of the venue. Party throwers and party-goers unite: The Funky Monk is the place to have your next group event! Whatever you’re celebrating, we’re with it. From bachelor & bachelorette parties to work parties, graduation parties, and even “just because parties,” our staff is ready to help make your event as memorable as can be!